Almost 80 people signed up for this webinar, with Jay Arthur demonstrating how to use some of the useful features of QI Macros, as well as some of the new features introduced in recent versions of the software. Continue Reading "2/13/19 QI Macros Webinar"
Posted by Jay Arthur in Excel, QI Macros, Six Sigma. Over 30 people signed up for this webinar, with Jay Arthur demonstrating how to use some of the useful features of QI Macros, as well as some of the new features introduced in recent versions of the software. Continue Reading "*Latest webinar: 4/11/19 QI Macros Webinar"
Posted by Jay Arthur in Data Mining, Excel, QI Macros, Six Sigma. Continue Reading "9/13/18 QI Macros Webinar"
Posted by Jay Arthur in Data Mining, Excel, QI Macros. Continue Reading "8/14/18 QI Macros Webinar"
Posted by Jay Arthur in Data Mining, Excel, QI Macros, Six Sigma, Statistics. 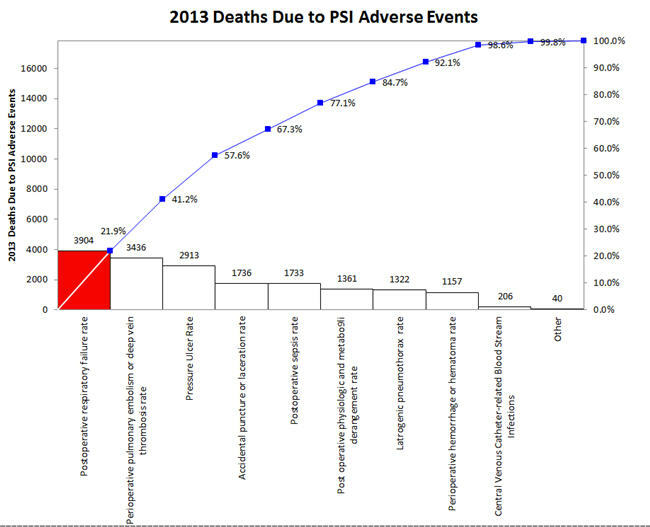 But wouldn’t a Pareto chart illuminate the important adverse events more clearly? 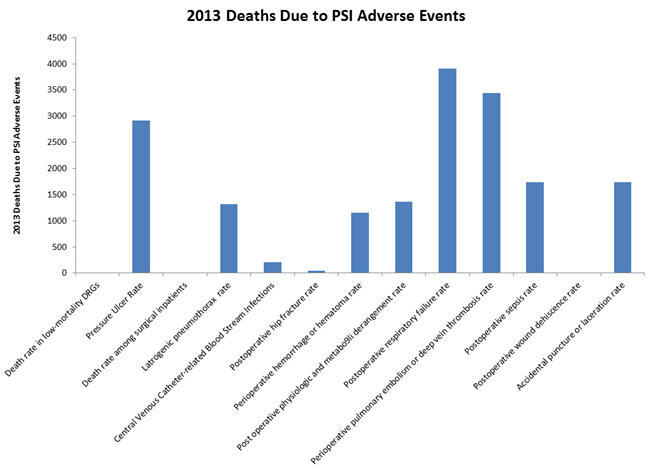 The first three accounted for over 57% of 2013 deaths. Continue Reading "Excel Column Charts Hide The Signal in Noise"
At the IHI 28th Forum in Orlando, one visitor to our exhibit booth said: “I’m bad at math.” She was worried about needing to learn formulas. I hear this same concern from most people thrust into quality improvement. I told her: “You don’t need to know formulas. You just need to know how to select data with a mouse and click a button in the QIMacros.” She looked at me incredulously. Then I showed her how easy it is to do it. This is one way that Six Sigma has failed America, by trying to turn people into statisticians. Most people are afraid of math and statistics. Continue Reading "Bad at Math?" 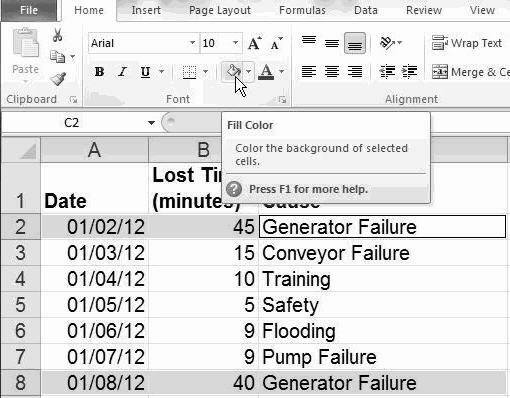 You can use Excel’s data formatting, commenting and filtering tools to help visualize and clarify your data. Excel has many powerful data exploration and visualization tools. Play with them! 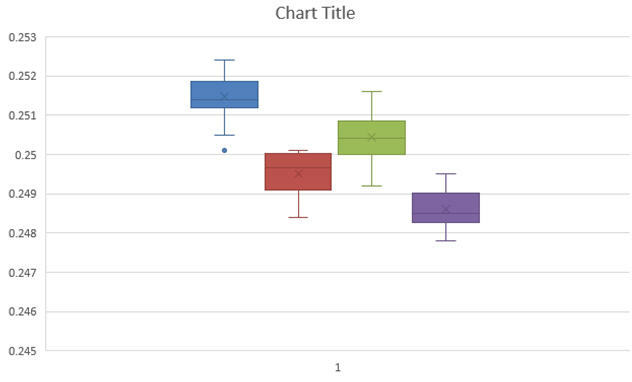 Continue Reading "Data Visualization and Exploration In Excel"
Posted by Jay Arthur in Excel, Six Sigma. What’s Wrong with the New Excel 2016’s Box and Whisker Plot? You might notice that the whiskers have a crossbar on the end. It seems to have a spare “x” in the middle of each box and it’s a little hard to see where the median is. And there are unnecessary gridlines that are considered chartjunk. It does, however, show the outlier below the first box. The whiskers are whiskers. The median is easily visible. 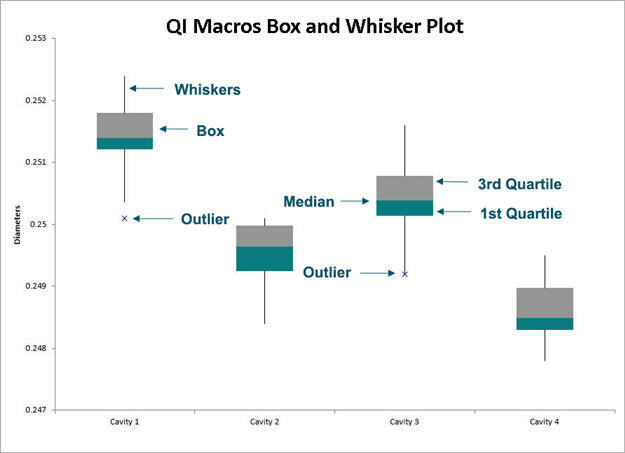 Continue Reading "What’s Wrong with the New Excel 2016’s Box and Whisker Plot?" Posted by Jay Arthur in Excel, QI Macros, Six Sigma, Statistics.